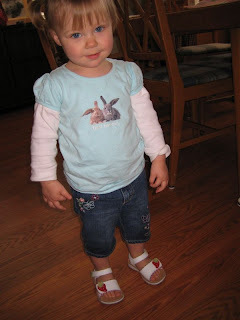 Bekah got some new sandles for the summer. She loves taking them off and having us put them back on. Silly mommy wasn't thinking about how easy velcro is for little fingers to undo. Maybe next time we will get buckles. 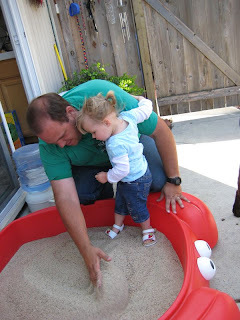 On Saturday we got a new sandbox for Bekah. She loves sand!! However she had never been in the sand in her barefeet. 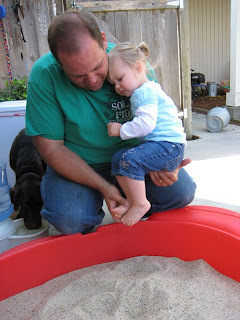 Chris put her in the sandbox and she started crying and trying to climb onto him. 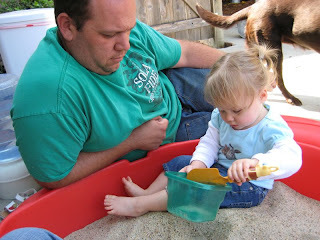 After a few minutes of holding her and watching mommy play in the sand she calmed down and really enjoyed it. Yesterday Bekah walked into the kitchen with a smile on her face and her hands full of little white beads. The beads ended up being little mints that we had gotten at the Woman's Retreat. She gave them to me and then said " Good" as clear as day. As she said it I could see a bunch of the mints in her mouth. When I went to investigate the living room the mints were spread all over the place. She helped me pick them up and then started shoving mints in her mouth. I told her she was not to eat them. She immediately spit them into her hand and threw it away. Oh she is so cute when she is getting in trouble. Love the mint story. :) She's definitely got a sweet tooth like her mama. I'm glad she has her own sandbox to play in now. 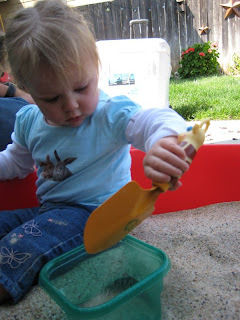 Kelsey had a thing about sand until she was older than Bekah. If we tried to put her down in the sand, she'd throw her feet up in the air and SCREAM. 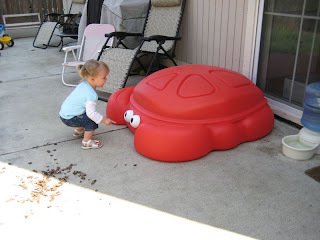 This applied both at the beach and in a sandbox. Something about sand and Kelsey just didn't mix!